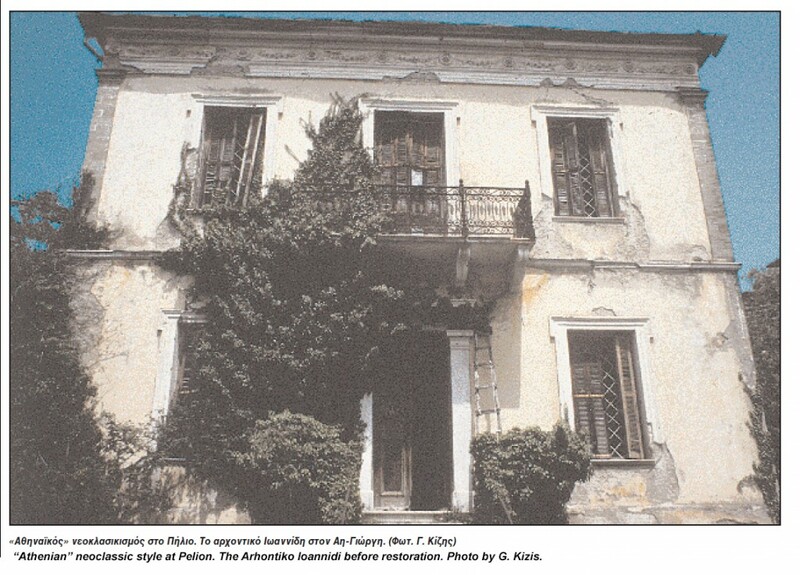 One of the oldest and most remarkable neoclassical mansions of Pelion. 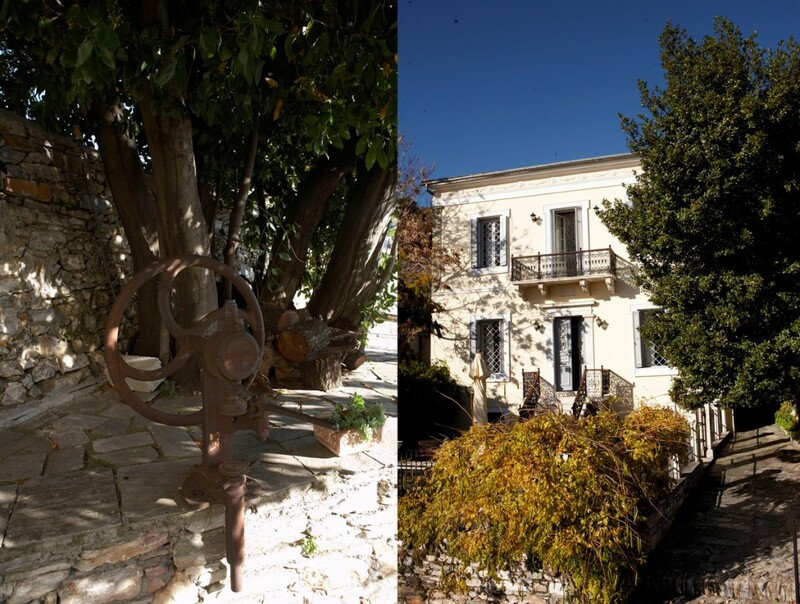 The history of Archontiko Stathopoulou is dated back in the 19th century! Built by the local trader Ioannidis when he returned wealthy from Egypt to his home village Ag. Georgios in 1888. What is said from local residents of the village is that Ioannidis was so rich he was carried on a throne so that he would not touch the ground. The most characteristic embellishment of the mansion are the ceiling murals, creations of well known prominent painters Ioannidis brought with him from Egypt, and those of the local famous painter Kasdasi. Unfortunately we do not know precisely the artist of each painting, we do know they were various artists comprising different styles and influences. The Hermes Lounge got its name from the illustration on the ceiling mural of Hermes, god and protector of trade, whereas looking carefully at his feet you may see the goods Ioannidis used to trade. On its left and right there are two of the gods of Olympus, Zeus and Athena. Displayed in the corners and perimeter garlands of the mural there are various monuments of cities Ioannidis had developed commerce. On the ceiling of the entrance, it was originally illustrated Rigas Feraios, probably a work by Theophilos that his heirs took and sold. The painting was found on and purchased by an eminent scholar and historical Kitsos Makris and later by the prefecture of Magnesia.It can be now be found at the the office of the local governor. We do hope that it will return sometime in our mansion, where it originally belongs. The destruction mid to late 20th century. Year after year the Mansion started to collapse and was looted by locals and foreigners. Αlthough ruined it was declared in 1986 from the Ministry of Culture as a “Work of Art”. 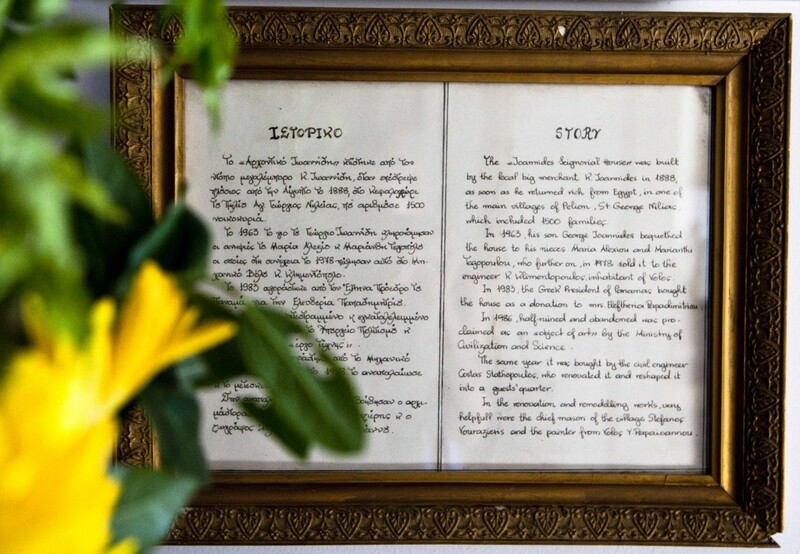 The same year engineer Kostas Stathopoulos purchased it and with sensitivity and taste exceptionally renovated and restored it to a unique luxury boutique hotel. The lounge ceilings and most of the rooms were ruined by water leaks. The windows, the roof and the door lintels were also half destroyed mostly by strong earthquakes. The marble steps had been detached. The garden marble pillars were severely damaged and the patio was full of stone and iron piles. All the small houses and the surrounding stone-walls located in the courtyard, that used to accomodate the servants at the time were also ruined. For two years a numerous crew worked hard for the repair of the mansion. With high sensitivity and joy, the current owner engineer Kostas Stathopoulos along with the local construction worker Stefanos Vourazieris and many other craftsmen carried out the heavy task of the restoration. The main display of the living room was restored by the artist Yiannis Papaioannou who painted it on a canvas tenter, studying the book of Kitsos Makris who had managed to photograph the original ceiling mural before the fall. Once placed on the roof, the painting linkages were made and experts completed the work under the supervision of the artist. The external destroyed window frames, were made of small white cement mosaic and placed with special glue and bolts around the windows. Based on information on the furniture and the decoration of the mansion, elaborately carved with Egyptian influences at that time, antique furniture from Cairo, Egypt were purchased to match the style of Ioannidis era. For the current needs of the mansion, modern bathrooms in all rooms were installed despite the fact that at those times the bathrooms were located in the garden area. Four antique wooden closets, now to be found in the rooms were originally in the treasury, where lords kept all their valuables and expensive clothes. The ceiling drawings of the breakfast area, inspired by the greek mythology was created in 1995 by a remarkable artist and friend Christos Gousidis who also owns a house in our beautiful village. Ιn the entrance of our courtyard there is an old machine used to bottle olive oil. The current swimming pool was built as the extension of the old cistern of the Mansion. Across the cistern and over the warehouse there used to be a 2flour house and various buildings (toilets, laundry rooms, stables, warehouses) used mainly by servants. Of the above only the foundations and part of walls and ceilings were preserved as well as the sewer system that leads down to the stream. These small houses were restored to our unique private bungalows with panoramic view. Walnut, fruit and plane trees were planted to bring beauty to the garden and a path was opened all the way down to the riverbed always abundant of water. According to a legend deep down in the garden well there is a hidden treasure and many have tried to discover by descending down into the well or by using different machinery. In an old stone wall at the basement, now serving as the breakfast area, a series of iron boxes were found, the one inside the other keeping old loan contracts and turkish ownership titles of Ioannidis, now safely preserved in the archives of the current owner of the mansion.